As you may know, I have two cats. They're both 13 years old, and have been fighting for the last decade. It's just gotten to the point where whenever I see them face off or chase each other around, I just chant "BATTLECATS! 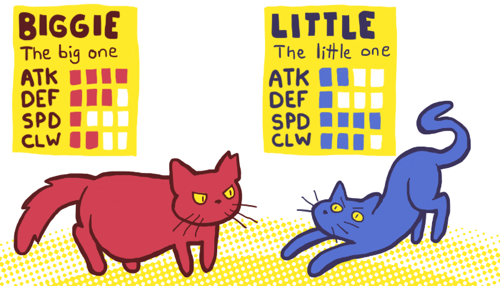 BATTLECATS! BATTLECATS!" Don't worry, they don't really hurt each other - that thing on Biggie's ear was done by a goose. How are Claw and Attack DIFFERENT THINGS. Claw improves climbing skills and increases chance for critical hits, of course.